Cities are instances of complex structures. They present several conflicting dynamics, emergence of unexpected patterns of mobility and behavior, as well as some degree of adaptation. To make sense of several aspects of cities, such as traffic flow, mobility, social welfare, social exclusion, and commodities, data mining may be an appropriate technique. Here, we analyze 72 neighborhoods in Mexico City in terms of economic, demographic, mobility, air quality and several other variables in years 2000 and in 2010. The visual information obtained by self-organizing map shows interesting and previously unseen patterns. For city planners, it is important to know how neighborhoods are distributed accordingly to demographic and economic variables. Also, it is important to observe how neighbors geographically close are distributed in terms of the mentioned variables. 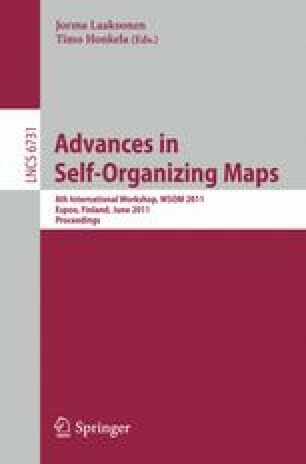 Self-organizing maps are a tool suitable for planners to seek for those correlations, as we show in our results.